Are you looking for a delicious seafood recipe with a difference? If you are, you’ve found it! Here’s my pasta ribbons with prawns and rocket for you to enjoy. 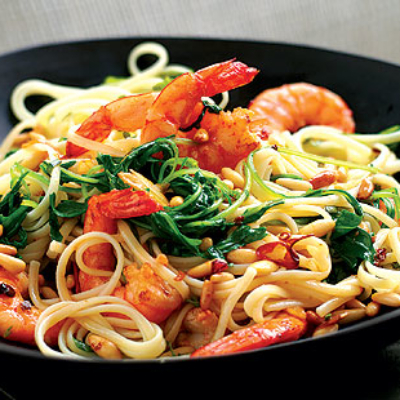 Feast your eyes on the finest pasta ribbons with prawns and rocket! It’s straightforward and fun to make this great dish. Simply follow the instructions below and get the perfect result. 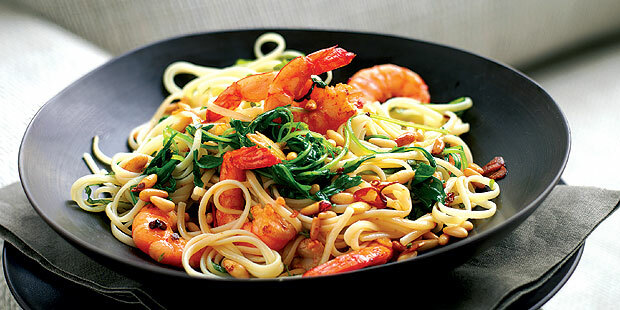 Heat the olive oil in a large frying pan and shallow-fry the garlic, pine nuts and chilli for about 20 seconds, then add the prawns and cook for about 1 minute. Add the wine and basil, season with salt and simmer over a high heat for about 2 minutes. Remove the pan from the heat. Meanwhile, cook the pasta in a large pan of boiling salted water until al dente. Drain and add to the frying pan. Return the frying pan to a high heat and immediately add in the rocket leaves, mix well for about 1 minute to allow the rocket to soften slightly and the pasta to absorb the flavour. 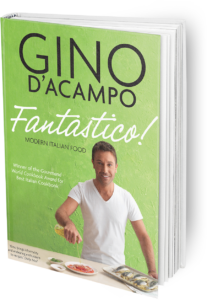 Once you’re done, simply sit back and enjoy your pasta ribbons with prawns and rocket and don’t forget to check out other great authentic Italian recipes including great antipasti recipes, Italian pasta recipes, Italian soup recipes, Italian beef dishes and authentic pizza recipes.